If you think all adhesives are the same…well, you just don’t know Jack. PC is founded and incorporated by Jack Long with the main product being concrete stucco that would be sprayed onto buildings to help waterproof and seal them. Jack Long invents PC-7 in his basement by using the epoxy to fill cracks and voids in walls and floors. At this time, the product does not have a name. PC-7 is created and released on the market after initial success with selling the product to tradesmen and contractors through word-of-mouth. Jack perfects the epoxy after 7 attempts to make the product exactly what he wanted. The name PC-7 is born! The first PC-7 Crazy Bottle Display is created. 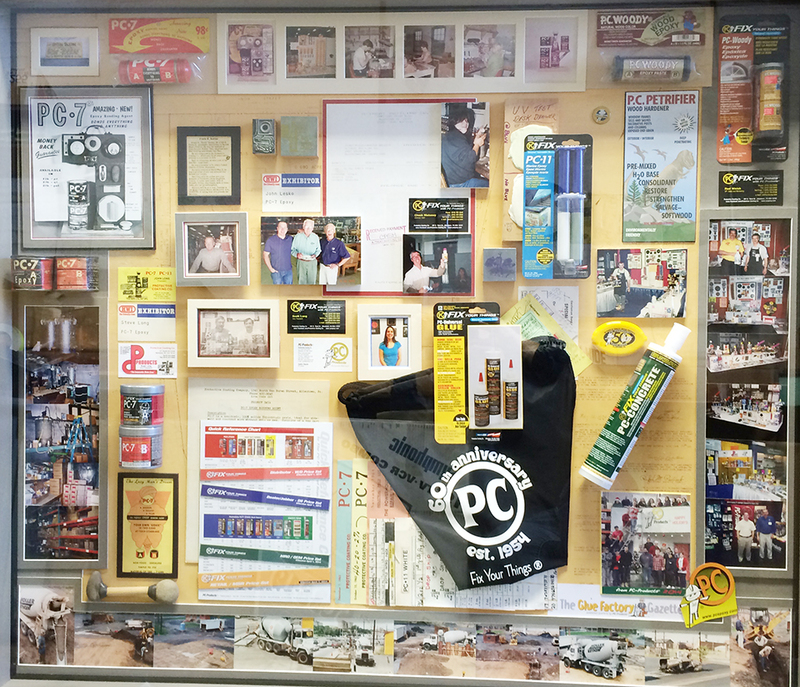 This is PC's 1st point of purchase display. After Steve, Jack’s oldest son, got home from active duty in Vietnam, he began working for Protective Coating, officially making PC a family business. PC survives the GREAT FLOOD at 3rd and Union! PC undergoes construction with a major addition, which will eventually come to be known as the famous B BUILDING. ACE Hardware corporate issues an ‘Environmental Recognition’ Award to PC-Products for using recycled packaging. PC-11 is introduced to market. PC-Woody is introduced to market. PC Putties are trademarked – Marine, Metal, Crete, and Lumber. PC-Petrifier wins a ‘Retailer’s Choice’ award from Do It Yourself Retailing Magazine. PC-Plumbing and PC-Rot Terminator are introduced to market. PC-Plumbing wins the ‘Retailer’s Choice’ award. PC-Concrete is introduced to market. PC-Masonry and PC-Clear are introduced to market. PC receives the Business of the Month award from AEDC for the month of September. PC-Auto Bond is introduced to market. PC-Xtreme Polyurea is introduced to market.